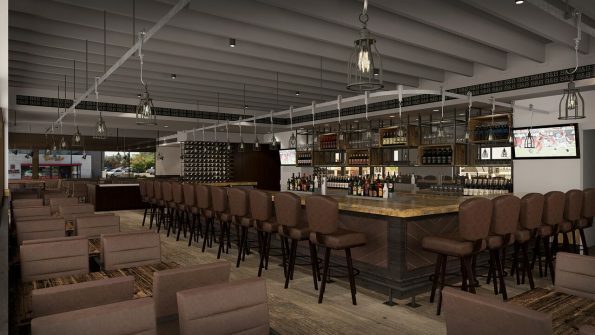 Square One Concepts, Inc. continues to expand this Fall with the opening of its newest concept, Bourbon & Bones Chophouse & Bar (BourbonandBonesAZ.com), coming in early Sept., delivering a unique fine dining experience to thousands of residents and visitors in Old Town Scottsdale. Located in a landmark Old Town Scottsdale location at 4200 N. Scottsdale Road, on the corner of 3rd Avenue and Scottsdale Road in a mid-century modern building, the highly anticipated spot also represents a significant economic investment in the city with the redevelopment of the central city block of Scottsdale Road between 3rd and 5th Avenues, which also includes their adjacent locations of Crab & Mermaid Fish Shop and Cold Beers & Cheeseburgers. This significant redevelopment of extensive frontage on the city’s main thoroughfare is seen by thousands of residents and visitors each year. The modern, industrial venue has a 4000 square-foot interior styled with reclaimed wood and hand-forged accents featuring distressed leather booths and walnut tables along with a private dining room. Dinner will be served seven days a week with Happy Hour Monday-Friday, 3-6pm. Bourbon & Bones hours of operation are 3pm-1am. On Fridays only, they will offer a “Power Lunch” from 11-3 for those looking for a new type of lunch experience. Bourbon & Bones plans an inventive menu featuring classic American fare focusing on wet aged and dry aged cuts of beef, an extensive list of 75+ high-end bourbons, a 750 bottle glass wine case and a robust cocktail program for the sophisticated aficionado. Chef Isaac Carter who leads the helm on the most recently launched brand of Square One Concepts, Crab & Mermaid Fish Shop, serves as executive chef for both restaurants. Carter, formerly with the Todd English Enterprises with restaurants in Boston, New York and Las Vegas, among others, was recruited to Phoenix to oversee the culinary programs of the newest Square One Concept brands. Meanwhile, Chef Isaac graduated from the Culinary Institute of America in Hyde Park, N.Y., after completing studies at Ithaca College in Ithaca, N.Y., and Temple University in Philadelphia. His culinary career includes the 12-year tenure with English, respected restaurateur, author and entrepreneur. Carter worked for English at the original Olives in Charlestown, Mass., where his skills and hard work landed him in Las Vegas to oversee Olives at Bellagio Las Vegas, where DailyFork.com once described Carter as Todd English’s “Golden Boy.” As English’s regional chef, Carter opened Eva Longoria’s Las Vegas Beso restaurant and Todd English’s Pub. Carter also served as sous chef at the Metropolitan Museum of Art in New York City, overseeing the nine restaurants in the museum and most recently spent time as executive chef of Bull Run Restaurant in Shirley, Mass. At Bull Run, Carter employed, literally, a farm-to-table approach in that semi-rural area, which is evident at Crab & Mermaid Fish Shop and will be in play at Bourbon & Bones Chophouse & Bar as well. Bourbon & Bones is the youngest brand of Square One Concepts located in Old Town Scottsdale. The modern, upscale chophouse offers an extensive high-end bourbon list of more than 75 bourbons as well as a classic handcrafted cocktail program, along with a selection of craft beers and fine wines, all with a with a modern twist. The menu features top quality dry and wet aged steaks including bone-in cuts and chops, fresh seafood and Chef Isaac Carter’s signature side dishes in an upbeat boutique fine dining setting. Open seven days a week from 3pm-1am. Happy Hour Monday-Friday 3-6pm and a “Power Lunch” on Fridays only from 11-3. Bourbon & Bones, 4200 N. Scottsdale Road Scottsdale, Ariz. 85251. 480.941.0101 Visit BourbonandBonesAZ.com for more information.